On a comfortable length of thread (about 5'), pick up the initial ring of an even number of cylinder beads. This number will vary depending on the size of the cabochon and how tightly you stitch the bezel. The cabochon used in the photos is about 30mm x 22mm and used a ring of 50 cylinder beads. Always make sure that you pick up an even number of cylinder beads! Pass the needle through the first bead in the ring and pull tight. You can tie the ring of seed beads into a knot before passing the needle through the first bead if desired. 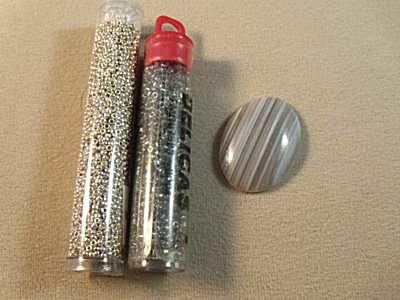 To make sure that you have a sufficient number of seed beads, hold the ring up against the back of the cabochon. You should have no more than 1/8" around the outside edge of the cabochon. If your seed bead ring is too small, the bezel will not fit correctly. It is usually better to have a few extra beads than to have too few. A slightly large bezel can easily be tightened using a row or two of size 15 seed beads, but a bezel that is too tight will be impossible to fit correctly. Working in tubular even count peyote stitch, stitch the first round. Keep the work flat with your fingers as you stitch, and make sure that you make the step up at the end of the round. Double check the size by holding the completed first round up against the back of the cabochon. If you have more than 1/8" of space between the edge of the bezel and your cabochon, you will need to tear the work out and add more seed beads to make the bezel larger. Stitch a second round of peyote stitch, keeping the work flat with your fingers. At the end of the round, make the step up and check the size against the back of the cabochon. With the opening of the bezel centered against the back of the cabochon, you should be very near the edge. Continue to stitch around in tubular peyote stitch, making the step up at the end of each row. You will probably have to stitch a total of about 7 or 8 rows until the beadwork starts to show around the back of the cabochon as in the photograph. Remember to keep the work flat with your fingers. If some thread starts to show between beads and stitches, don't worry about it - it will mostly disappear when you cinch the bezel around the cabochon later. Once the beadwork starts to show around the edge of the cabochon, you will hold the bezel against the beadwork as you stitch the remaining rounds. To make this easier, hold the beadwork and the bezel in your non-dominant hand while you stitch with your dominant hand. At this point, you can start to tug slightly as you stitch the rounds. The work will start to curl up around the edge of the cabochon. For the next two or three rows, tighten your tension as you stitch. The peyote stitch should start to curl up around the edge of the cabochon and will eventually hold the cabochon without any assistance from you. Stitch one or two more rows around the bezel once it starts to come up over the top edge of the cabochon. If the work starts to buckle or warp as you stitch, you have stitched too many rows and should tear out the excess rows. To tighten the front of the bezel, add a row of size 15 seed beads in a matching or contrasting color. If the back of the bezel seems loose, you can also add a row of size 15 seed beads using the tail of the thread and pull snugly. Weave the ends of the thread into the beadwork, knot, weave in a bit more, and trim thread close to the beadwork. Once you are finished with the bezel, you can embellish it however you desire with fringe or embroidery. Add a strap for a necklace or a couple of strands of beads on either side with a clasp for a bracelet. Smaller cabs can be turned into earrings with the addition of a small seed bead loop at the tops of the cabochons.